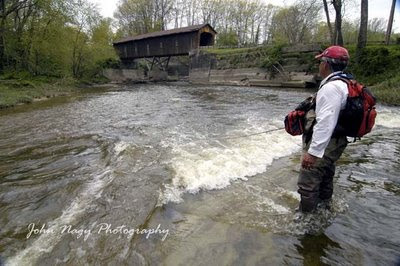 The famous “steelhead alley” region of southern Lake Erie encompasses a group of steelhead tributary streams and rivers that stretch from New York, through Pennsylvania and into Ohio. The potential to “hook-up” with steelhead on these unique tributaries is excellent, but for consistent success in steelhead alley, steelheaders need to do a good amount of trip preparation and planning. This includes fly tackle considerations, fly selection, daily monitoring of weather reports and run-off conditions and having the right equipment (waders, clothing, accessories) to deal with varied weather and tributary water conditions. Selecting the proper fly tackle would be at the top of the list for preparing a trip to steelhead alley. For dead-drift presentations, which are effective most of the time in the normally cold flows of the Lake Erie tributaries, longer fly rods in the 9-11 foot range, in medium to medium-fast actions and 6 to 7 line weights are very popular. These rods are ideal for reaching out in the classic “high-stick” nymphing rod position with long leaders (up to 14 feet which minimizes floating fly line contact with the water) to achieve drag-free drifts along the stream bottom. The length and more moderate action of these fly rods also help to play larger steelhead on the lighter tippets which are often used when dead-drifting small egg patterns and bead-head nymphs to fussy, drag-conscious steelhead. For swinging flies, stiffer/faster, single-handed rods, 9 to 10 foot long in 6 to 8 line weights are more appropriate for casting, shooting and mending both floating fly lines and various sinking systems. Down-sized, double-handed rods (also known as “switch rods”) give the steelheader the ability to do standard single-handed casts or spey type casts (single-hand double haul, two-handed overhead and two-handed anchor point spey casts) for more distance, less casting fatigue and avoiding rear obstacles. High-stick nymphing and swing presentations are also easily done with switch rods as well. Switch rods typically come in 10 ½ to 11½ foot lengths and 5 to 8 line weights. Typical sinking systems for swinging include a weight-forward floating fly line, “loop-to-loop” connected to either a custom made mini sink tip made from sinking shooting head material, a sinking leader or a longer interchangeable sink tip head. The loop-to-loop connection allows for various lengths and sink rates of sinking materials to be used depending on the flow and depth of the water as well as the size of the tributary. For swinging flies the leader varies from 2 to 8 feet with the shorter lengths ideal to keep flies down near the stream bottom as tributary flows cool later in the fall. Tippets as heavy as 12 lb. test can be used since drag-free drifts are not a concern and steelhead normally will not see the tippet as the fly “swims” on the swing. There are a super abundance of fly reels on the market but first pick a reel that balances the weight of the fly rod, including the fly line strung through the guides. This is an important consideration (especially when using a longer fly rod) since fly reels these days are being manufactured more and more lighter for the same line weights and capacities. You don’t want to cast a fly rod that is tip heavy all day due to too light of a fly reel. This can lead to both bad casting and casting fatigue. The drag of the fly reel is very important for steelhead fishing. Look for a zero or slow start-up inertia (initial drag engagement) to protect tippets from sudden steelhead surges or runs, a good range of light end adjustment settings for tippet protection also and a drag that is sealed from grit and dirt as well from water which can freeze and lock drags up during winter steelheading. Large arbor reel designs increase line pickup speed dramatically and come in handy when a steelie is running right towards you after you hook him! A successful steelhead alley trip always starts at your fly tying vice or the fly bins of your local fly shop. For egg patterns the specific pattern is not as important as is varying the size, color and material density for the water conditions at hand. This means carrying a selection of eggs in sizes #6-#16, in bright neon colors with added flash from Flashabou or Estaz (for stained flows) and pastel/muted colors (for clearer flows). Densely tied egg patterns are great for murky water and sparsely tied eggs that have a translucent effect are best for clear water. An assortment of bead-head nymphs in sizes #10-#16 (some with flash or rubber legs added) work great in tandem with an egg pattern especially when kept close together (less than 6 inches). If the steelhead does not take the egg pattern, which acts as an attractor in stained water, he will often take the bead-head nymph which is nearby. For swinging flies, choose wooly bugger, streamer, soft hackle, spey and tube patterns that incorporate materials like marabou, rabbit fur strip, artic fox tail, T’s fur, schlappen, guinea and grouse feathers and soft, long fibered synthetic materials like polar fiber. These materials all impart irresistible movement to the fly as it is swung down-and-across in the current. White or lightly colored flies work best on sunny days due to their ability to reflect light. Large, darker patterns are more easily spotted by a steelhead on overcast days and in stained water due to their large profile. Pressured water (especially if it is low and clear) often requires multiple fly pattern changes to get hook-ups. Also, unique patterns (those off the wall, one-of-a-kind concoctions!) often get results in this type of water since the steelies have never seen them before. Another necessary element in trip preparation for steelhead alley would be monitoring weather reports and tributary run-off conditions in order to predict “prime” conditions (to be defined shortly) for a specific tributary or tributaries. Prime conditions are very important since the normal base flow of most Lake Erie tributaries is low and clear due to poor ground water flow. This obviously makes for extremely tough fishing. Lake Erie tributaries require run-off from rain and/or snow-melt to get them up to fishable levels. These increased flows (you want to be there after peak run-off as the tributaries are dropping) allow for a number of things including: more effective execution of fly presentation techniques, increase steelhead holding and resting lies, initiation of fresh runs of steelhead in from the lake, push steelhead further up the tributaries toward spawning gravel and energize steelhead that have already been in the tributaries and have been stressed from low, clear water conditions and fishing pressure. Most importantly, prime fishing conditions mean ideal water flow and clarity which makes for much more cooperative fly takers (especially for fresh run steelhead). For most Lake Erie steelheader’s prime water conditions are signaled by fishable and wadable tributary flows that have a characteristic olive green-tint coloration. This coloration allows steelhead some visibility in the water but at the same time allows the steelhead to feel secure and thereby maintain his sense of curiosity and experimentation to take flies. The run-off rates of the steelhead alley tributaries vary from tributary to tributary due to differences in watershed sizes. Tributary run-off rate is the time it takes in hours, days and weeks for a tributary to run-off to prime conditions following a rain fall or snow-melt episode (see Steelhead Guide book by John Nagy for tributary run-off rate tables which are based on an “average” rain fall or snow-melt episode of an inch of rain or equivalent snow/ice melt occurring in a 24 hour period). If you know the run-off rates of the tributaries and the ongoing and forecasted weather in relation to expected rain fall and/or snow-melt, you can predict when prime conditions will occur for tributary or tributaries over a several day period. This will enable you to target the “right” tributary or tributaries for the specific day(s) your fishing and should markedly increase your hook-up percentage. Incoming weather systems to the Lake Erie region can be closely monitored by watching weekly weather reports and national/regional radar displays on the weather channel and internet weather sites. Precipitation from ongoing rain/snow events can be more precisely followed through local weather radar displays as well as local 24 hour rain fall precipitation amounts which are monitored by the National Weather Service and can be found at http://www.nws.noaa.gov/ and also on local weather reports. A limited number of Lake Erie tributaries have operating USGS river gages on them that measure real-time water flow in discharge (cubic feet per second) and stage (feet). This data is displayed 24/7 on the internet at http://water.usgs.gov/realtime.html, http://steelheadsite.com and also http://www.fishusa.com/fisherie/ (the later 2 sites also provide fishing reports). Local tackle shops and local steelhead fisherman are also good sources for current water flow information (in terms of water levels and clarity) for tributaries in their area. Steelheaders fishing the steelhead alley tributaries will encounter a myriad of weather and run-off conditions through the fall, winter and spring periods of a steelhead season. -waist length, breathable/waterproof, wading jacket. -waist length, wind-resistant, fleece jacket (worn under wading jacket). -Capeline underwear (medium and heavy types). -fleece or wool fingerless gloves, ball cap (visor helps block sun), knit cap. -breathable chest waders with felt or rubber bottom/studded wading boots (breathable or neoprene waders with boot foot designs keep feet warmer in winter ice water flows). -disposable hand warmer packets or compact Zippo hand warmer. -water hydration bladder, small flashlight, sun tan lotion, energy bars and a mini first aid kit. -collapsible steelhead-size landing net with vest net release or “Landing Hand” mesh mitten for hand gripping/tailing fish. - weighing scale (some nets have scales built into their handles). -dropper fly rig box for carrying pre-tied tandem fly rigs. -nippers, forceps, fresh tippet material, spare leaders and various sink tips (leader wallets are ideal for organizing these). -split shot (including soft shot variety with smaller sizes). -floating indicators in various sizes and colors. -polarized sunglasses for spotting fish and reading water surface current breaks. -compact/water resistant camera with waterproof carrying case. -a large capacity vest with a shoulder suspension system to carry all this stuff! More detailed information on preparing and planning for a steelhead alley fly fishing trip can be found in John Nagy’s book “Steelhead Guide, Fly Fishing Techniques and Strategies for Lake Erie Steelhead”.